First I need to explain the name. 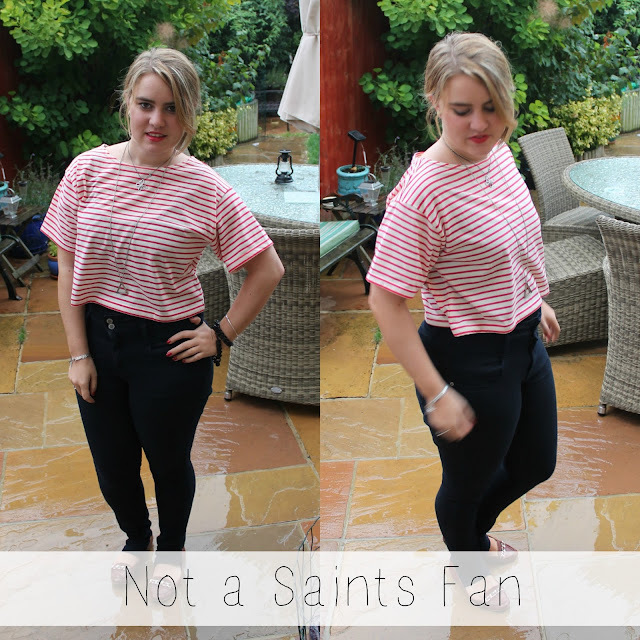 I may have accidently worn this to Southampton on the first day of the Premiership, with my boyfriend - who happened to be wearing an actual Saints shirt. This happened to look like I was also supporting Southampton. So no, not a Saints fan! Just an unfortunate coincidence. So, I bought this breton style crop top, thinking it would be longer, not a crop top, but there you go. It came like this and I do still like it. Probably not the most flattering on me in these photos but I think it looks nice in real life. I also managed to match my lips with this gorgeous lippy from Revlon, part of their ColorStay Suede Lipstick collection in the shade of Finale. Really seems to match it well! How do you match your lips and outfit?